I remember, few years back, a huge pet food scandal. Melamine was found in certain brands of food that could be traced to Chinese production plants, and hundreds of animals died as a result of renal failure. Recalls occurred in North America, South Africa, and Europe. Now, the problem mostly centered around canned/wet foods, but as I have several furry family members, it peaked my attention to a problem I hadn't actually thought much about (which kind of made me feel guilty): was I feeding my pets "good" food? I immediately looked into brands, ingredients, and place of origin. The majority of the problem pet foods came from an Ontario-based company - Menu Foods. Specific products included Sunshine Mills (dog biscuits), Nestle- Purina and Alpo (why does this not surprise me? ), Science Diet, Natural Balance, Dr. Fosters & Smith, Kirkland (Costco), and Diamond Pet Foods (Chicken Soup for the Pet For the Pet Lover's Soul and Nutra Nuggets). At first, the concern was a chemical called aminopterin, but soon shifted to melamine - which is a chemical used in the production of plastics - found in wheat gluten samples retrieved from some of the recalled pet foods and urine samples from affected pets. It was also found in rice protein, used in Natural Balance pet foods. Some people opted to feed their pets home-made food. I searched for a new pet food and supplemented with meat from our own meals. 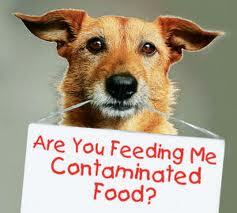 The same "Genetically Engineered Food Right to Know Act" that applied to human foods applied to pet foods, as well. (For more information on this, see my previous post, "The Future of Food" - Pharming?). The bill, proposed in 2010 by Rep. Dennis Kucinich (D-OH), would have required foods that contain a GM (genetically modified) material be labeled accordingly. Unfortunately, the bill never passed (doesn't mean it won't be re-introduced!). The bill that did pass (The Food Safety Bill) does not require companies to label their GM foods. It does, however increase the FDA's power to inspect foods and places stricter standards on imported foods. It also affects the safety of pet foods. The struggle for safer foods and better labeling continues. Be a part of it. If you love your pets and are concerned about their health (as well as your health and that of your loved ones, duh! )...visit the National Health Federation's website and sign the petition (Say NO to GMO). Understandably, all legislation comes with loopholes and can sometimes do exactly the opposite of what the public expects. Make sure to read the bills, not just the titles...and make your own educated decision. (For example, it can be very expensive for companies to obtain certain labels. This means that a lot of small companies are left out and can be negatively impacted. They can even be put out of business if they are required to pay for a label they can't afford. It's a tough decision for a consumer to make - is the labeling process and the appearance of that label on a product worth the possible negative outcomes?) Every issue has two sides. It's important to weigh the pros and cons based on your own research. It'd be nice if we could trust our governing officials to keep our best interests at heart, but unfortunately, too many of them have been bought by big industry and powerful lobbyists. Keep in mind that just because a pet food has been recalled before, it doesn't mean the food is bad now or that the company hasn't made efforts to improve their product. And research will prove that not all consumer advocates agree on what is "good" and what is "bad". Read labels, just like you would for your own food. Good Guide's Cat Food Ratings: Which products are best and worst? I have 5 pets and a limited budget...so I'm just as guilty as anyone when it comes to buy the most affordable brands. For me, it's about compromise...just like it is for me. I try to find the best product at the best product. I usually can't afford the "perfect" product. Or, I simply don't have ease of access, living where I do. In order to support local, I have to make some important choices. I buy Kirkland's brand of Dog Food. Here's how it measures up according to Dog Food Adviser. I also feed my cats Kirkland brand cat food. Here's how it measures up, according to Cat Food Reviews. Neither food is "top of the line", but they meet my requirements: regional company, affordable, and decent ingredients (no artificial preservatives/colors and haven't appeared on the FDA recall list). NOTE: Kirkland canned dog food DID appear on the list during the 2007 recalls.